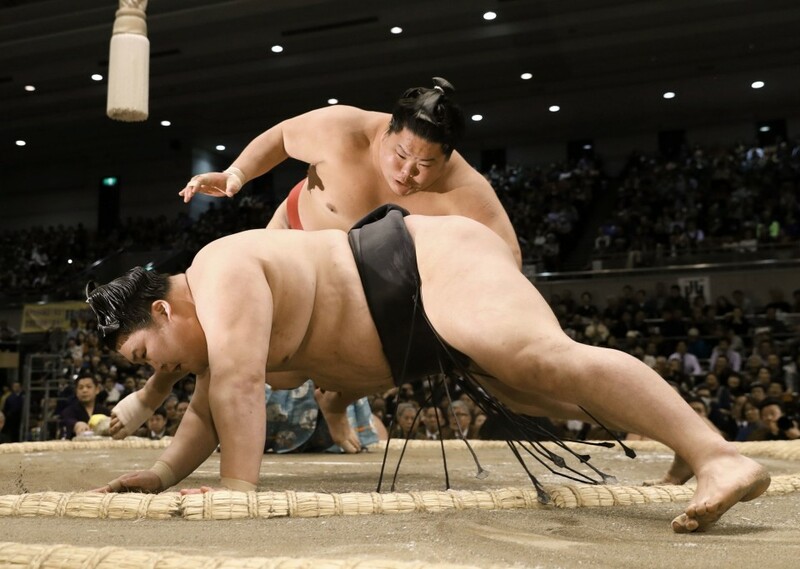 Yokozuna Hakuho maintained his flawless record at the Spring Grand Sumo Tournament on Friday, as the ranks of unbeaten wrestlers were whittled down to just two. The Mongolian superstar, who is pursuing a record-extending 42nd top-level championship at Edion Arena Osaka, overcame winless No. 3 maegashira Nishikigi by frontal force out in the penultimate bout on Day 6 of the 15-day tournament. 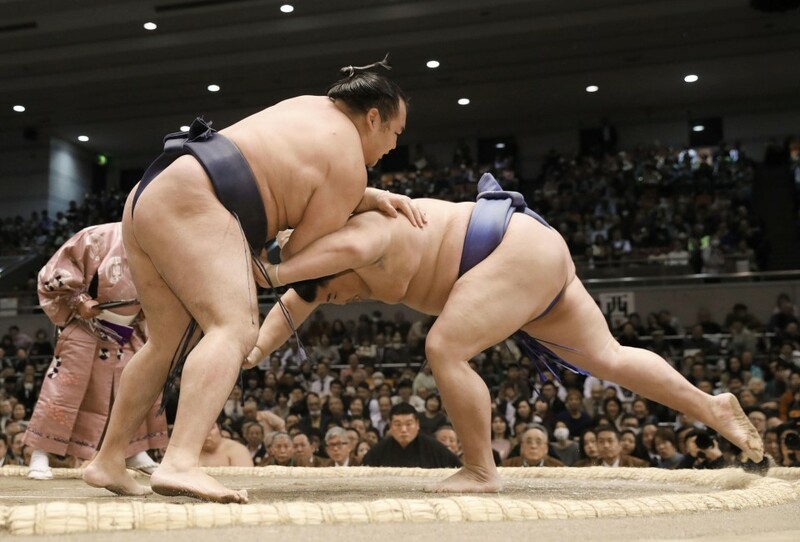 Following a fierce collision, Nishikigi locked Hakuho's right arm, but the yokozuna countered with a belt grip. With the pair latched onto each other at the center of the ring, Nishikigi maneuvered for an arm-lock throw, but Hakuho held his ground, took a double inside grip, then drove his opponent out. Gigantic No. 4 maegashira Ichinojo is the other wrestler with a perfect 6-0 record. He stayed in the hunt for a maiden championship by dispatching No. 1 Endo (1-5) with a slap-down. The pair exchanged pushes and slaps at the outset before 1.93-meter behemoth Ichinojo pulled his opponent face-first to the clay. Local favorite Goeido took his first loss of the tournament, losing a second straight meeting against No. 2 Daieisho. The ozeki, a native of Osaka's Neyagawa city, lost momentum after the jump as he unsuccessfully sought an inside grip, giving the maegashira an opening. Daieisho (3-3), who has also beaten ozeki Takayasu and sekiwake Tamawashi here, quickly surged forward to drive Goeido out. "The initial charge was good, and I was able to push him away," Daieisho told NHK in his post-bout interview. "The quality of my sumo has been very good and I want to continue it to the final day. (The wins over elite wrestlers) have boosted my confidence, but I'd like to do much better." No. 8 Kotoshogiku (5-1) also took his first loss of the meet, getting forced out by No. 7 Aoiyama (5-1). The Bulgarian-born maegashira drove both hands high into Kotoshogiku's chest and bulldozed the former ozeki out backwards. The other Mongolian grand champion, Kakuryu, picked up his fifth straight win with a slap-down of No. 3 Shodai (0-6). After missing a belt hold, Kakuryu (5-1) drove Shodai to the edge but the maegashira surged back. After a back-and-forth shoving battle, the yokozuna slapped his opponent to the clay. The injury hampered ozeki, who needs a winning record here to keep his rank, secured a strong hold at the opening clash and, after a short tussle, sent Mitakeumi tumbling to the clay. Sekiwake Takakeisho improved to 4-2 by pushing out winless No. 1 Kaisei. After a hard collision, the rising star, who is chasing promotion to ozeki, turned Kaisei around and shoved him out from behind. Sekiwake Tamawashi, winner of the January grand tournament, dug deep to beat newly promoted komusubi Hokutofuji and improve to 3-3. 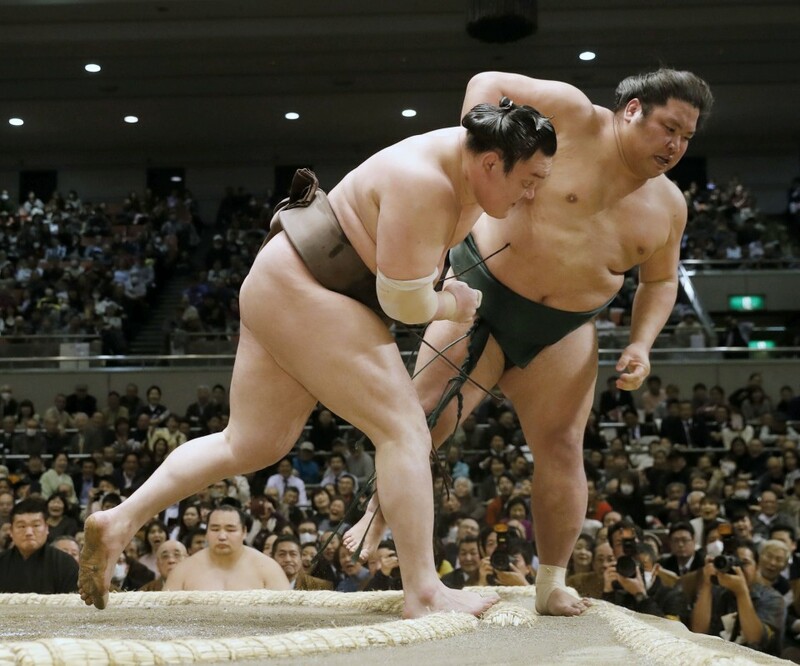 In a battle of pusher-thrusters, Hokutofuji had the early momentum as he shoved Tamawashi to the edge of the straw. But the Mongolian fought his way back, driving Hokutofuji (2-4) to the opposite side before toppling him with a powerful shove.